Tesla's announcement last year of the construction of its Gigafactory in Nevada was an important milestone in the growing momentum of the green energy market, and battery production in particular. Tesla's new factory drew the world's attention to lithium, but most of the large lithium-ion factories are being built in China. Indeed, Amperex Technology Ltd (CATL), Panasonic Corp., LG Chem Ltd. and Boston Power Inc. are all planning new lithium plants in China, and Samsung and BYD Co. plans to expand the existing factories they own. According to data from Benchmark Mineral Intelligence, lithium-ion plants in China have a current annual capacity of 16.4 GWh, but this combined capacity is expected to reach 107.5 GWh by 2020. This ramp-up would mean that China will have captured 62% of the world's lithium-ion battery production capacity within three years. By comparison, Tesla's Gigafactory has a planned capacity of 35 GWh of cells and 50 GWh of packs by 2020. Pilbara Minerals Ltd.'s Managing Director and CEO Ken Brinsden said that while innovators like Tesla, Samsung and Panasonic have typically been "poster children" for the lithium-ion battery industry, the really big growth is actually coming from China. "Over time we've become more and more deeply integrated with the market in China, and China is really the key driver as far as lithium markets are concerned," he told S&P Global Market Intelligence. "They have become the biggest consumer of lithium raw materials, they've become the key price driver with respect to lithium raw materials as a function of consumption in that market, and the reality is the lithium-ion supply chain is growing much faster than the western world is giving it credit for." 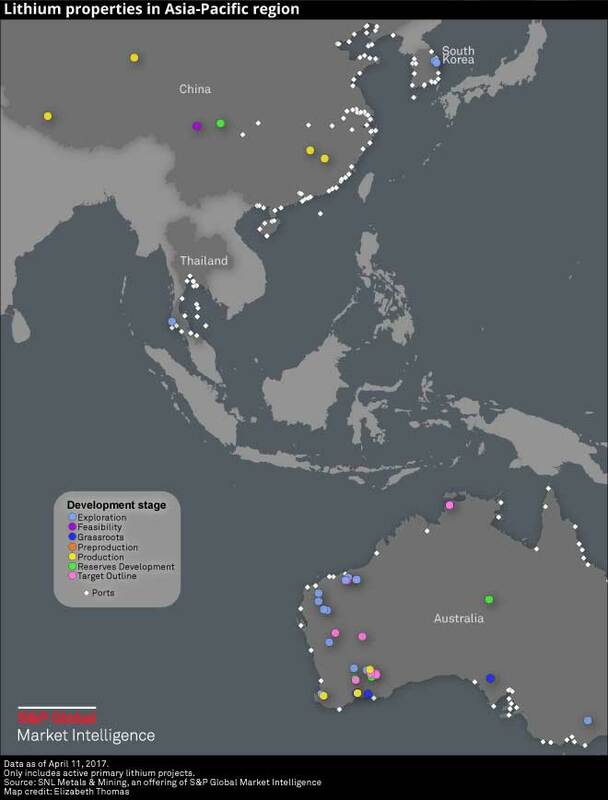 Looking at publicly reported projects, the Asia-Pacific region hosts 24% of the world's lithium properties, which is second only to the U.S. and Canada, which in turn account for 48%. There are 52 primary lithium properties in Asia Pacific: 43 in Australia, six in China, two in South Korea and one in Thailand. Copyright © 2017 by S&P Global Market Intelligence, a division of S&P Global Inc. All rights reserved. No content may be reproduced or distributed without the prior written permission of S&P Global Market Intelligence or its affiliates. The content is provided on an “as is” basis.